Consistent daily training makes all the difference in achieving your rank. Because there is so much to learn and everything builds from kihon, it is important to make a commitment to try to learn something new about your martial art, no matter how small, every day. Consistent daily training makes all the difference in achieving your rank. Because there is so much to learn and everything builds from kihon, it is important to make a commitment to try to learn something new about your martial art, no matter how small, every day. In order to gain that new piece of information, you will need to practice your art form a little bit each day whether there is a formally scheduled class or not. No matter how many times a strategy, technique, or application is explained by your instructor, there is nothing like experiencing the concept for yourself to truly understand and internalize it. Consequently, you need to make a commitment to practice on your own rather than just working in class with other students. As you struggle to remember movements of a kata or define applications for a technique, you can take real ownership of the knowledge you discover and learn confidence from your achievements. Many new martial arts students are leery of training independently prior to understanding techniques at an intermediate or higher level. The most common fear is that of “learning it wrong” as most assume that once something has been learned incorrectly it becomes difficult, if not impossible, to correct. To help students overcome this concern and facilitate their ability to progress more quickly, many instructors will assign “homework” to individual students. It might be something as simple as watching television for ten minutes while standing in a particular stance, or hitting a punching bag a certain number of times using a particular technique. This homework is always based on something your teacher feels that you know well enough to practice properly, but for which additional improvement is still necessary. If homework is not given to you by your instructor, assign it to yourself. Once a pattern of independent training has been established, most students incorporate it into their daily habits. Those who do progress much faster than those who do not. If you really want to earn your black belt as expeditiously as possible, you will need to practice continually, but you also must do so effectively as well. Your instructor is your first and most effective source of this knowledge; you cannot know what and how to train without spending time in the classroom. Attendance, therefore, must become a priority. While training starts in the dojo, it is never restricted to the dojo. In real life you are not likely to be attacked in a wide-open, obstacle-free area while you are already warmed up and wearing your gi. 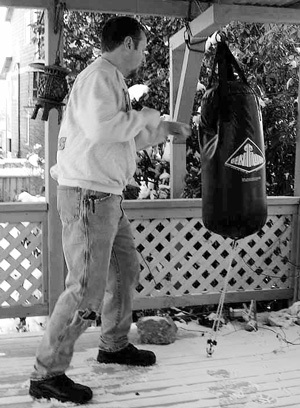 Practicing outside the dojo on occasion can, therefore, help you realistically prepare for street confrontations. It is very important to understand how you might interpret applications should you be fighting on a hill, around furniture or other obstacles, in a stairwell, under water, in a crowd, or in any other unusual situation. While you need to be able to perform your techniques wearing a traditional loose-fitting gi, you must also know the restrictions of your street clothes as well. You can practice elements of your art just about anywhere. Having said that, however, it is prudent to avoid doing anything in public that might inadvertently provoke a fight, get you arrested, scare your neighbors, or cause other forms of trouble. Wearing your uniform and belt on the street, for example, could certainly invite confrontations. Practicing swordsmanship in a public park is less advisable than doing so in a secluded backyard where you will not appear threatening to anyone. Working kata in an empty gym at your health club will generally go over much better than performing the same movements in other venues. Do not limit yourself solely to physical practice. You can think about your art throughout the day, particularly when you are stuck in traffic, sitting on hold (on the phone), or otherwise not engaged in important activities. Visualize techniques, analyze applications, and walk through exercises in your mind. Think about strategies and tactics for succeeding in self-defense scenarios and tournament situations. Training should never be restricted to the obvious either. You can practice stances and balance in moving transportation (e.g., airplane aisles, boats, trains, buses), do breathing exercises in the shower, perform calisthenics in front of the TV, or practice kata in your living room. Think up creative ways and places to train. The possibilities are nearly endless. Varying your routine will help you stay focused and motivated to learn. Just because someone has earned a black belt does not necessarily guarantee that person will be any good at teaching. Furthermore, even if your sensei is a fabulous instructor that fact alone does not necessarily guarantee that he or she can teach to your learning style and meet all your educational needs more effectively than everyone else in the world. Take advantage of every opportunity to learn from everyone in your class, not just your instructor. Ask others how they see things. Because people learn and process information in a variety of different ways, the odds are good that you can find someone in your class who has unique insight into resolving whatever challenges you are currently experiencing or difficulties you are about to encounter. Diverse perspectives can be valuable. We have stumbled across epiphanies in our training simply by talking about issues and practicing techniques with a variety of knowledgeable people. Tandem drills (e.g., bunkai, kumite, randori) are nearly impossible to perform on your own, so soliciting a training partner to work with outside of class can be very helpful. Work one-on-one with classmates or instructors, and participate in extra focus sessions whenever they become available. On the street, sane individuals simply do not pick fights with people they are convinced they cannot beat. Consequently, it is extremely important to train with partners who are bigger, stronger, and/or more skilled than you are whenever you have the opportunity. Working with practitioners who are taller, shorter, older, younger, or stronger than you are helps you train for any real-life possibility. Unlike tournament competitions, street combatants are not segregated by size, weight, age, gender, or rank. Look for opportunities to take seminars, participate in tournaments, and work with folks outside your dojo on occasion too. These opportunities can help round out your training but be sure to check with your sensei beforehand to understand the etiquette for handling these situations. Your teacher will help ensure that you are capable and prepared before attending. Another excellent learning opportunity is the chance to teach. You clearly cannot teach effectively without in-depth knowledge of your subject matter, so preparing to teach others helps you internalize the material and develop a deeper understanding of the techniques you will instruct. Sensei frequently ask higher-ranking students to lead portions of a class (e.g., daruma, kata, kiso kumite, or kata bunkai). Additionally, senior students are usually required to practice with their juniors from time to time, helping them advance their skills. This also helps instructors ensure a productive classroom environment by accommodating a variety of skill levels simultaneously, making efficient use of class time, and optimizing the amount of personal attention that the instructor has with each student. While every bit of this aforementioned advice is valid, it is equally important to remember that you are striving to earn a black belt, not to join a monastery, shave your head, and become a Shaolin monk. Unless you are dedicating your whole life to martial arts, it is critical to balance work, family, religious, and social commitments along with your training. Frankly, it is simply not healthy to live in the dojo every waking hour of the day. Overtraining can be just as detrimental as undertraining. Commit yourself to daily practice but not at the expense of your work or school, your health, your family, or your friends. Martial arts are both broad and deep, covering far more information than anyone can learn at one time. Mastery occurs slowly, building highly complex knowledge, skills, and abilities from fundamental building blocks and foundational materials. These building blocks are laid out logically in a predefined set of competencies that must be mastered at each stage of development so that practitioners can advance from rank to rank. Consistent daily training makes all the difference in achieving new ranks expeditiously. It is important to make a commitment to practice your art daily, trying to learn something new, no matter how small, with each practice session. This training begins in class, but should never be restricted to the dojo. Solo practice, seminars, and other opportunities to train and teach can help practitioners learn and advance more quickly. Do not limit yourself solely to physical practice. You can think about your art throughout the day, visualize applications, and exercise your mind as well.